Many of our native insect pollinators are disappearing - victims of pesticides, habitat destruction, and mono-culture farming methods. That means much lower crop yields for food crops such as melons, cucumbers, squash, pumpkins, peppers, beans, tomatoes, all fruit trees, berries, and feed crops such as clover, alfalfa and buckwheat. Honeybees are efficient pollinators, and since they are also easily handled and transported, can be a very cost-effective way to dramatically increase crop yield. Our pollination business is as scalable as your operation requires. We can supply two hives, or two hundred. 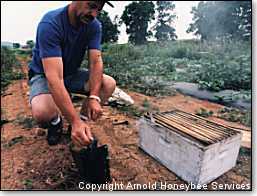 Arnold Honeybee Services can travel anywhere in the Southeast. Email us for details and pricing. If you’d rather purchase than lease, we also sell complete hives.